"This was the best tasting iced coffee I've ever had. Since the flavors are extracted without heat, the results are a smoother, less acidic, less bitter product. You can use the coffee concentrate straight on ice cream or gelato for a classic Italian treat  affogato." Whisk together ground coffee and cold water in a small bowl. Cover with plastic wrap and set aside for 12 hours. Whisk, then strain through a funnel lined with a moistened paper towel into a bowl. Place ice cream scoops in 2 coffee or espresso cups. Pour 1/4 to 1/2 cup cold coffee over the top of each. Garnish with shaved dark chocolate. 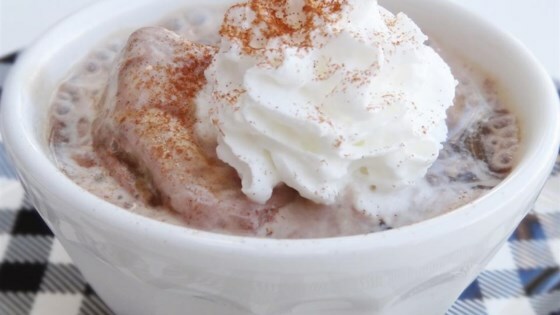 See how to make an amazing hot weather ice-cream and cold-coffee dessert. Disappointed. If you want a nice smooth drink you don't want to wait for 12 hrs while it is cold brewing. Think we'll stick with using espresso & put in fridge, add ice cream & shaved chocolate. Delicious! So simple, so tasty and so refreshing. I loved it! It's so good; I think I'm addicted! super yumm, fancy and easy!